The Piazza del Duomo ("Cathedral Square") is a wide, walled area at the heart of the city of Pisa, Tuscany, Italy, recognized as one of the main centers for medieval art in the world. Partly paved and partly grassed, it is dominated by four great religious edifices: the Duomo, the Leaning Tower, the Baptistry and the Camposanto. It is otherwise known as Piazza dei Miracoli ("Square of Miracles"). 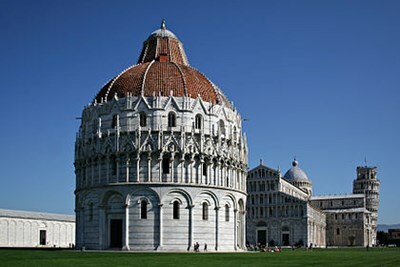 This description uses material from the Wikipedia article on Piazza dei Miracoli and is licensed under the Creative Commons Attribution-ShareAlike License (view authors). 20 people want to do this. 21 people have done this.